To many mainstream-media saturated Americans, the terms “progressive” and “religious” may not seem to go hand-in-hand. As religion is usually tied to conse rvatism, an important way in which religion and politics intersect is being overlooked. 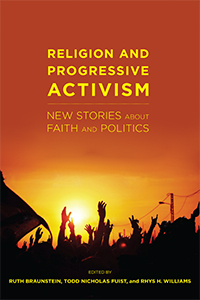 Religion and Progressive Activism focuses on this significant intersection, revealing that progressive religious activists are a driving force in American public life, involved in almost every political issue or area of public concern. In a coherent and accessible way, this book engages and rethinks long accepted theories of religion, of social movements, and of the role of faith in democratic politics and civic life. Moreover, by challenging common perceptions of religiously motivated activism, it offers a more grounded and nuanced understanding of religion and the American political landscape.